I’m going to spare you the cliché references to Punxsutawney Phil and throwing wood in order to get straight to the topic of getting rid of groundhogs, or woodchucks, or whatever you like to call them. 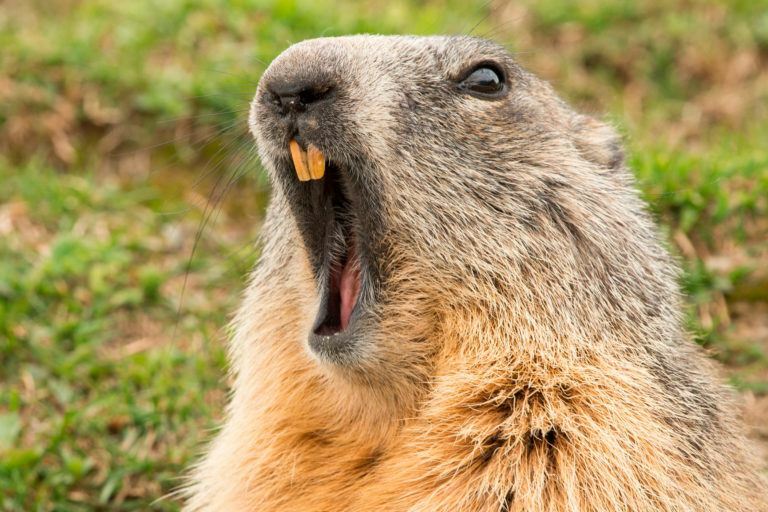 Why do we call groundhogs “woodchucks?” Well, woodchuck is actually the first name used to describe groundhogs; the word “woodchuck” itself is a jerkization of the original Algonquian name for the animal, which I’m not even going to try spelling out here. Anyway, groundhogs and woodchucks are the same thing, and they are a member of the squirrel family. They’re rodents who not only dig, but can swim, and even climb trees. Most of the time groundhogs are a harmless animal. Groundhogs will usually mind their own business—unless there’s a garden nearby. Gardeners beware: groundhogs are notorious garden feeders, with a taste legumes, root vegetables, and I guess they’re partial to alfalfa. Chances are you’re looking up how to get rid of groundhogs because it’s close to September or October and they’re raiding your garden in an attempt to fatten up for the their big winter sleep. If you’re a gardener, I can understand your dismay. Now, don’t confuse groundhogs with ground squirrels or gophers; they are very different creatures. While gophers will do a number to your lawn, groundhogs don’t usually build a tunnel network with a lot of mounds. I guess this makes them less of a threat to your precious lawn, but let’s not get into the my take on the moral depravity of murdering a chubby little groundhog for the sake of your perfect little lawn; instead, let’s do this: we’ll start with the non-lethal groundhog control measures and make our way toward groundhog traps and trapping tips. Perhaps by the time you’re done reading this, you’ll have had a change of heart and will decide to relocate your chunky little buddies instead of poisoning them like most people do. Groundhogs burrow beneath ground, creating a tunnel network that is roughly 25′-30′ worth of tunnel with chambers for food, hibernating, and no less than two mounds: one for casual access and another for escape. Groundhogs use their tunnels to mate, sleep, eat, and hide. Hibernation periods depend on the climate, but preparations (feeding) for hibernation usually begin in the Fall around September or October. In the spring, around March or April, groundhogs usually emerge from their dens with 4-5 young ones who will stick around for a couple of months before going off to dig their own burrows. The average number of groundhogs in a populated area is one or two groundhogs per acre, so a severe infestation is relatively rare—almost impossible really, unless they’ve established themselves on farmland, where damage to crops can become an economic liability. To get rid of groundhogs from your garden, fencing is perhaps the most humane form of pest control. This is probably not the most reliable strategy for those trigger-happy individuals who want their groundhogs gone now. Fencing should be used primarily to keep groundhogs out of specific places, like your lovely garden. 1″-3″ chicken wire or wire mesh fencing should be sufficient, so long as it’s buried at least 12″-18″ below the surface and about 2′ above the surface. Remember, you’re dealing with a creature that can dig, so the more fencing you lay below the earth, the better. The use of groundhog repellents as a way to get rid of groundhogs is questionable but a non-lethal tactic worth trying. I say “questionable” because a majority of the groundhog repellents on the market have almost no scientific evidence or research behind them to back up their claims—most of it is anecdotal or testimonial evidence. I guess if you’re the trusting type, and you really don’t want to kill or relocate your groundhogs, you might want to try a groundhog repellent and let us know how it works. Shake-Away by Critter-Repellent.com, and Critter Ridder by Havahart® are just two of the groundhog repellent products that we’re aware of. Using live traps to get rid of groundhogs without harming them is perhaps your best form of direct groundhog control. Trapping groundhogs isn’t easy—I won’t kid you here—unless you know where their high traffic areas are. It’s been suggested that if you do borrow or purchase a cage trap, you should set it out in such a way that the trap door won’t shut for 2-3 days, to allow the groundhog to get used to the idea of a free meal in a metal cage. Once they’ve built up a routine around feeding out of the cage, set the trap door to close normally. Cover the trap with a cloth sheet and transport the animal to another shady, wooded area far enough from your home that you won’t risk it’s return. Give the animal time to leave the trap under its own power once you’ve found an appropriate spot. You can find a wide variety of live traps for ground hogs from Amazon. Fumigation is the most efficient and effortless way to get rid of groundhogs. Fumigation, as I mentioned in our article on rodents, is the most common and effective means of groundhog control. Fumigation is usually done with either gas cartridges that produce carbon monoxide or with aluminum phosphide pellets. Groundhog fumigation should be done in the spring (late April, early May) before the young leave the nest, and is most effective when moist soil is used to cover the burrows, sealing the gases in and leaving no means of escape for the groundhogs. This tactic should not be used for groundhog dens that are found beneath houses or other residential structures, and you should contact your local conservation officer beforehand to ensure you’re not breaking any laws. You can use lethal traps to get rid of groundhogs, but shooting is the preferred method of lethal groundhog control. Of course, if you live in an urban area trapping and shooting might be illegal. You should check with your local conservation officer or law enforcement center to make certain you’re not breaking any laws by busting out the old varmint gun. Trapping, on the other hand, is considered less dangerous than the use of firearms, but steps need to be taken to ensure that children, pets, and other animals are not snared instead. You probably shouldn’t put a steel leghold trap down in your yard if you live next to a daycare center—unless you’re one of those people. Wash your traps with plain old dish soap (preferably unscented) before setting them, and use latex rubber gloves to handle the traps. This way you won’t leave the suspicious smell of human behind. Groundhogs and other rodents have very sensitive noses and will be less inclined to wander into a trap if it reeks of human beings. Make sure to steady the trap on a flat surface or with weights to prevent it from shaking. Remember that groundhogs can weigh up to ten pounds. That’s a lot of weight for a rodent, and a trap that shakes when a groundhog enters it is more likely to snap shut before the groundhog is all the way in. Either that, or the groundhog will find the shaking suspicious and won’t enter the trap at all. Put a couple of heavy rocks or logs alongside the trap to keep it properly anchored. Find out what the groundhog is eating and use that as a bait. If you have a garden-feeder on your hands, make a note of what vegetables they’re really digging into, and use that as the bait for your traps. I’ve heard that groundhogs are partial to fresh alfalfa, peas, and beans. Check your groundhog traps on a regular basis. This should be obvious, but making sure you didn’t capture something you shouldn’t have or that you don’t leave a groundhog sitting a cage for days without food or water is the humane thing to do. Don’t forget to check your traps, and wash them when you’re done using them. Animals tend to empty their bladders when they’re trapped or frightened. Critter Ridder repellent by Havahart is an OMRI organic gardening approved repellent that works by odor and taste. It comes in both liquid form and granules, while the liquid form is still in the process of being proven “organic” by OMRI. Repellents like this aren’t usually considered the most effective means of groundhog control, but they are natural and non-toxic—so they’re worth a try, right? Well, for about $16 for a 2lb bottle of Critter Ridder at Amazon, that’s your call to make. Lawn maintenance and property management is perhaps one of the more effective means of natural groundhog control. As it is with most other rodents and small mammals, clearing brush, debris, piles of wood and rocks, and other hiding places from your lawn will help deter groundhogs from making a home near yours. Groundhogs often burrow under buildings, so you may want to consider keeping brush and tall grasses trimmed around buildings, and maybe even bury some fencing around them to prevent burrowing.